The Atlanta Falcons opened their 2009 pre-season with a one point loss to the Detroit Lions. The preying birds welcomed the 2010 pre-season against the Kansas City Chiefs at the Georgia Dome tonight. Would the Falcons do their fans proud? Televised by NBC, the first quarter started with the Chiefs kicking to the Falcons. Matt Ryan took his place as quarterback. Several plays later, kicker Matt Bryant made a thirty-yard field goal. Atlanta 3 and Kansas City 0. Matt Cassel went in as quarterback when the Chiefs went on the offensive. Three plays later, the Chiefs punted the ball back to the Falcons. Matt Ryan’s complete vs. incomplete passes during Atlanta’s second possession was about even. Kicker Steve Hauschka was sent in to attempt a fifty-three yard FG–it was no good. Slow-motion instant replay after the commercial break revealed that his ball was two to four feet too low; it hit the crossbar. With three minutes left in the first quarter, Falcons Kroy Biermann knocked the ball out of Matt Cassel’s hands and the Falcons recovered it. Chris Redman stepped in on QB watch; unfortunately, he didn’t perform as well as he’s demonstrated in the past. They had to punt the ball away by the bottom of the quarter. The second quarter began with the Chiefs improving upon offensive execution. Kicker Ryan Succop tried but missed a fifty-three.five yard FG. The ball ricocheted off the left upright. Chris Redman was at QB in the top of the second quarter and his first pass was complete to wide receiver Roddy White. Matt Bryant’s second field goal, at fifty yards, was unsuccessful (wide right). Ryan Succop’s second FG attempt, at fifty-three yards, was no good either (wide right). Brodie Croyle took over quarterback gig for the Chiefs in the bottom of the second quarter. The Chiefs were focused on making a touchdown with under a minute left in the first half. They’d have to settle for a twenty-yard FG. Atlanta 3 and Kansas City 3. The Chiefs went on offense first in the third quarter. Brodie Croyle was back as QB and threw an interception two or three plays in…right into the bosom of rookie safety Shann Schillinger. Chris Redman returned as quarterback. A series of good plays led to a touchdown via running back Dimitri Nance. Atlanta 10 and Kansas City 3. The Chiefs’ defense was making more noise in the middle of the quarter, at which point John Parker Wilson had gone in as QB for the Falcons. He moved his teammates down the field to a sneeze away from the end zone. Dimitri Nance crossed the goal line two plays into the fourth quarter. He did a little dance, just a little one. Atlanta 17 and Kansas City 3. The Chiefs turned the game over by way of Falcons cornerback Chevis Jackson intercepting Brodie Croyle. Steve Hauschka’s thirty-seven yard FG went through minutes later. Atlanta 20 and Kansas City 3. Chiefs defensive back Javier Arenas made a 100 yard return for a TD when Kansas City received the ball next. A holding penalty on Chiefs lineback Justin Cole quashed that TD, though. Tyler Palko was QB for that possession. The fourth quarter was scoreless for the Chiefs until there were fewer than thirty seconds left in the game. Palko flung his body over the goal line and broke the plane for a second. Atlanta 20 and Kansas City 10. Final score. 1. Randy Waters and Brian Baldinger were commentators. 2. The Chiefs’ white tops (with red numbers), white bottoms (with red-yellow stripe down the side), and red helmets made them look like cheesecake. 3. Matt Ryan looked fantastic tonight, corporeally speaking. Great form. The South has certainly rubbed off on him; he now talks with a more pronounced accent. Giddy yup. 4. Former Notre Dame coach Charlie Weis is now offensive coordinator for the Chiefs. 5. Halftime consisted of Falcons cornerback Dunta Robinson taking 11alive’s Fred Kalil to his high school Clarke Central in Athens. 6. Brodie Croyle is only two years younger than ming! 8. Falcons President Rich Mckay joined Waters and Baldinger in the top of the third quarter to chat about his team. McKay mentioned that he’s beginning to see John Parker Wilson’s arm strength. 9. The Falcons had the ball for some ten minutes from the middle of the third quarter through the top of the fourth. Upon returning from commercial break following Nance’s second TD, the camera was on a medium shot of the Falcons’ QBs sitting on a bench, backs facing the camera. Redman on the left, Wilson in the middle, and Ryan on the right. Numbers 8, 4, 2 respectively. Hmmm. 4^2=16. 16/2=8. 8/4=2. 2^2=4. 4×2=8. 2^3=8. 8-4=4. Redman and Ryan were wearing green caps. Forest green caps. 10. Sam Crenshaw interviewed Falcons on the sidelines throughout the evening. When he spoke with wide receiver Harry Douglas, Roddy White played peek-a-boo with the camera from behind Douglas. White smiled like a boy on his sweet sixteen birthday. Harry soon started chuckling. Get game summary, stats, and play-by-play here. Click here for a list of the players that did not participate in the festivities. 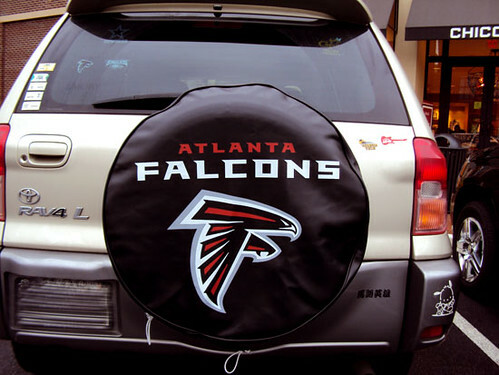 This entry was posted in Football and tagged Atlanta Falcons, Chris Redman, John Parker Wilson, Kansas City Chiefs, Matt Ryan, NFL on August 13, 2010 by sittingpugs.